PUERTO PRINCESA, -- The armament packages of the two armed AgustaWestland AW-109 helicopters of the Philippine Navy (PN) has finally arrived. This was disclosed by Navy public affairs spokesman Cmdr. Lued Lincuna during the sidelights of Monday's Pagasa Island trip. He said that the weapon systems, which consisted of rocket and machine gun mounts, have arrived and is now in the process of being moved to the hangar where the aircraft is stored. 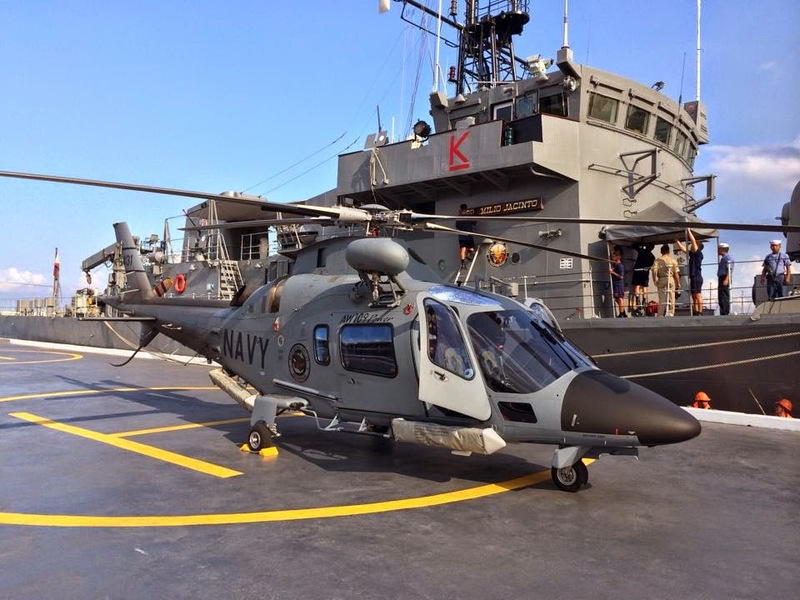 The two armed AW-109 airframes arrived in the Philippines last December. This is part of the five-helicopter deal, worth Php1.33-billion, signed by the Philippines with AgustaWestland in early 2013. Three of the AW-109s were delivered and commissioned in Dec. 22, 2014. The versions of the AW-109s will be armed with machine guns, 20mm cannons and possibly, with air-to-ground rockets. The AW-109 "Power" helicopter is a three-ton class eight seat helicopter powered by two Pratt and Whitney PW206C engines. Its superior speed, capacity and productivity combined with reliability and ease of maintenance make it the most cost effective maritime helicopter in its class. For shipboard operations, the aircraft has a reinforced-wheeled landing gear and deck mooring points as well as extensive corrosion protection measures. The ability to operate from small ships in high sea state enables the AW-109 to perform its mission when many other helicopters would be confined to the ship’s hangar. 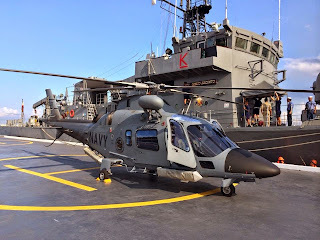 The Philippine Navy BRP Emilio Jacinto (PS-35) Patrol Corvette along side with AgustaWestland AW109 Maritime helicopter.